Spelling Power is a self-paced, individualized, simultaneously multi-sensory program that uses all four learning modalities: visual, auditory, kinetic, and tactile. This assures your student is taught through his optimum learning style. With Spelling Power, this multi-sensory approach is not limited to the study of words, but also is used during the Daily Pre-Tests and when completing skill-building activities. When you follow Spelling Power’s procedures, your student will use two different forms each day. These two forms are the Daily Test Sheets and the 10-Step-Study Sheets. They are integral to Spelling Power’s effectiveness. These forms are designed to guide you and your student through the daily pre-testing and study steps. They were created as a result of qualitative and quantitative, empirical, educational research. In this article, you will learn about some of the research behind the use of one of these forms. Spelling Power’s 10-Step-Study Sheets provide your student an efficient, effective method to study each word he needs to learn. They provide a space to complete each study step or a box to check after he has completed the step. Following the 10 steps, is a space for your student to write each of his study words in a sentence of his own creation. Research shows by composing a sentence your student will transfer up to five times as many study words into his daily writing. Each step of Spelling Power’s Daily Test and 10-Step-Study Sheets involves your student in completing simultaneous multi-sensory activities. Simultaneous, multi-sensory learning activities work because while each student has a predominate learning style learning is given power when the whole brain is engaged. Functional Magnetic Resonance Imaging (fMRI) studies done by researchers at MIT, MGH-IHP, and Harvard have proven activities involving each type of modality do indeed stimulate different areas and hemispheres of the brain (1). They also found that when an activity involved more than one modality, areas of the brain beyond those expected to be stimulated were stimulated. Spelling Power’s structured, simultaneous, multi-sensory activities actually create new neural pathways among the different areas of the brain. Creating these neural pathways mean your student improves his retention and enables him to more efficiently retrieve what he has learned when he needs it. 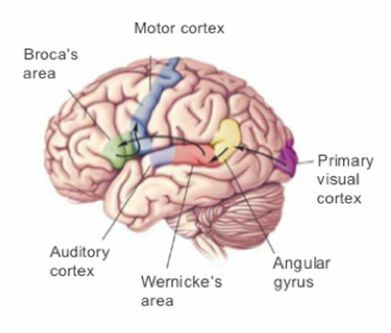 Neuroscientists say, “brain neurons that fire together, wire together”(2) These fMRI studies prove the long-held theories of learning experts, like Orton-Gillingham, who before had only antidotal data to back up their claims of the effectiveness of multi-sensory learning. While teaching using multiple learning styles is essential for the learning challenged, your average and gifted student find them equally beneficial. The 10-Step-Study Sheets, when used properly, are proven to increase your student’s spelling achievement over an extended period. A study was completed that compares the achievement of four groups of third through sixth grade students over a school year(3). All four groups were told the goal was to achieve a 100% score on the retest of their study words both during short term recall tests (24 hours) and also again over longer periods of a week and then again after several months. All four groups worked from the same type of spelling lists, presented in the same manner except for the way the students were taught to study the words. Group 1 was simply told to study their spelling words the best way they knew how. Group 2 was taught how to study words using a ten-step study procedure. Throughout the first week of instruction the steps were explained in detail and then occasionally during the term the students were verbally reminded to use the steps. Group 3 students were given the same first week of instructions, but were additionally provided an individual chart on which the study procedures were outlined for them to refer to on their own as needed. At frequent intervals throughout the term, their teacher reminded them to refer to their Study Tips Charts. Group 4 students, on the first day of instruction, were given booklets containing sets of forms on which to complete the daily pre-tests and to complete the ten study steps for each word they needed to master. 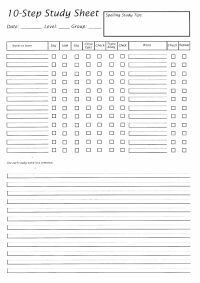 The 10-Step-Study Sheets provide spaces to complete or to check off each study step as it is completed. During the first week of the study, the steps and how to complete them were carefully described. Again, throughout the term their teacher reminded them how to use the forms, and checked if students were using them correctly. The differences in results, shown above, are amazing! 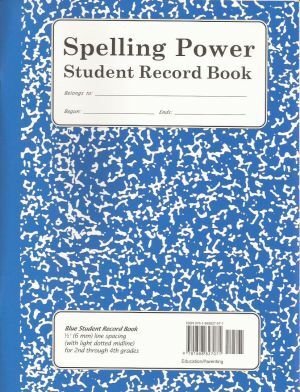 They show that Group 4: Students using the form books (now called Student Record Books) retained the correct spelling of their words at a higher percentage over various time sequences than did those students using other methods. Since permanent mastery of the high frequency words is one of the main goals of the spelling curriculum, the implications of this study should not be ignored. It shows that your student needs to be taught a definite, efficient way to study and a method that continually reminds him to use these study steps. To many adults, these study sheets seem unimportant and like mere busy work. To think all you need to do is tell your student how to study his spelling words is only natural. However, it is important to remember, for developmental reasons, your student processes information differently than you do. Using the forms, as shown above, has proven effective. Your student really will feel a sense of accomplishment as he checks off each step of the 10-Study-Sheet because it gives him a way to see his results and keep track of his progress. Here is a chart to help you select your student's Student Record Book. 1. Christodoulou, JoAnna. (2015) Cognitive Neuroscience of Reading: Making Sense of Research on Typical Development, Dyslexia and Case Studies using fMRI. Lecture about a joint neurological studies by MIT, MGH IHP and Harvard presented at WABIDA 2015 Fall Conference, Seattle, WA. 2. Sousa, D.A. (2006) How the Brain Learns. Thousand Oaks, CA: Corwin Press. 3. Adams-Gordon, Beverly L. (1988) Effectiveness of Spelling Study Methods: An Achievement Comparison of Four Groups of Third through Sixth Grade Students. Pacific Lutheran University, Tacoma, WA.